It is a condition of entry to all events that all competitors must complete a waiver form and wear an identification bracelet. Failure to comply will result in exclusion from events. All events run under the rules of the the Dungog A&H Association Inc.
All competitors must satisfy all safety requirements. The Committee reserves the right to alter the program if required. All rules and conditions explained fully at the start of the competition. 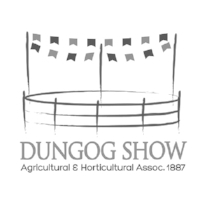 All competitors must provide and wear Personal Protective Equipment set by the rules and regulations of the Dungog A&H Association Inc. in all events as required. Failure to do so will mean automatic disqualification. All competitors participate in this competition wholly and solely at their own risk of injury to their person or property. The Association or Society will hold no responsibility for injury that may occur during competition. All competitors must sign a personal indemnity form prior to commencing race program. All saws used by the competitors shall be a type approved by the Committee. All officials and judges must wear ear hearing protection. A First Aid Kit will be available at competition site. A minimum distance of 8-10 metres must be provided between the competitors and spectators.